Matrix Endurance Series is specifically designed for endurance riding to offer the maximun protections, support and breathability required for intense long distance riding.  Available in three popular endurance shapes: Sport, English and Western. 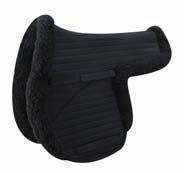 * The fleece botton is bi-level: 1 inch pile under the saddle, 1/2" pile behind the leg for improved heat disperal. * Linear quilt of ETC fabric and breathable/wickable batting. * Choose from a bottom lining of high-wicking WoolBack&REG; or heat-releasing CoolBack&REG;. 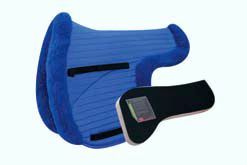 * ETC is an innovative fabric that provides a non-slip surface for a secure and stable saddle position. Breathability for maximum moisture and heat removal. Stain-resistant and easy to clean. * Spine-closure pocket provides access to inserts. Easy Care: Remove inserts before washing pad. WoolBack&REG; and CoolBack&REG;: Machine washable, dryer safe. Pro-Impact and Extreme Pro Inserts: Machine wash, line dry. Flex Form and Ortho-Impact Inserts: Wipe with damp cloth. 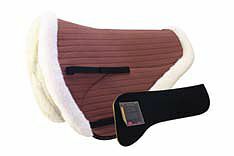 Matrix Endurance pads may ordered below in woolback or coolback, with or without inserts.